At the end of your commute a majestic lane flanked with old cedar trees welcomes you on your final leg to “Briar Cliff”. An Waterfront Estate like this is a rare find anywhere, especially on Maryland’s Upper Eastern Shore. 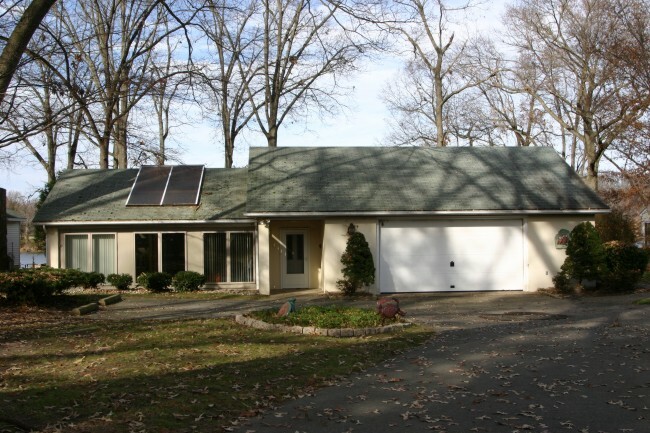 “Briar Cliff” is nestled on 6+ acres and has a 2-bedroom guest home and guest quarters above the two car detached garage. More than 570’ of shoreline on the Elk River ensures quiet and solitude. The main house, dating back to 1926, is a 5 bedroom 3 1/2 bath home that has the feeling and charm of an Alpine mountain lodge. The centerpiece is the Grand Hall with its massive stone fireplace, with access to the waterside deck via two sets of French doors. The views from the decks of both homes provide striking views of the Elk and Back Creek, which is the entrance to the C&D Canal. As you relax on the large deck you will see all types of pleasure craft and ships from around the world. Down the steps to the waterfront there is a building, which can house all your boating needs. The 100’ concrete pier, with more than 6” MLW, is the only one of its kind in Cecil County. There is also an extensive sandy beach for swimmers. North East Maryland is but a few minutes drive and is a renaissance town. There are many boutique shops and several restaurants that will satisfy even the most discerning palate. North East even has an annual Rubber Duck Race! This property has been in the owner’s family for over seventy-five years and provided generations of family and friends with irreplaceable memories. Take the time to visit “Briar Cliff” and see how this retreat can be your family’s memory maker. Cross the Maryland border near Middletown and suburbia happily gives way to horse pastures, farmland and small towns sprinkled with church steeples and clapboard houses. As you near the Sassafras River, the tension will slip from your shoulders. The sense of calmness only increases as you pull up to 275 Hall Creek Drive, which fronts Hall Creek and the Sassafras. Before you enter the home, listen to the water lap against the sand. See a bald eagle soar against a cloudless sky, and watch the sunlight sparkle on the water’s slate-blue surface. You can experience it all on Feb. 24, during an open house from 1 p.m. to 4 p.m. Simply put, this is an exceptional property on 3.83 remarkable acres. The expression “Pride of Ownership” is no cliché here. It’s the truth. From the hand-split cedar roof to the Cedar Perfection siding to the staircase crafted from maple and cherry, this two-story, three-bedroom property is brimming with thoughtful details. Consider the custom-milled door and window trim, which frames Andersen Windows with river views. There’s also custom but the bathrooms and a home theater boast ¾-inch maple floors, and the living and dining rooms feature a gleaming cherry inlay. A “compass inlay” punctuates the large entrance hall. There’s also custom millwork around the wood-burning fireplaces in both the living room and den. All The dramatic freestanding staircase and elegant columns in the formal living and dining rooms give these adjoining rooms a sense of expansiveness. They also offer uninterrupted views from windows on both sides of the house. Admittedly, the landscape is too tempting to resist. To experience nature up close, simply step through a living room door to the 260-square-foot screened porch – which features a two-story stone fireplace – and a 667-square-foot veranda, shielded by Tenara architectural fabric. Both are steps from the Sylvan in-ground pool, and all front the river. The veranda and pool are also accessible from the den/sunroom, which flows into a state-of-the-art kitchen. Again, no detail has been overlooked. High-end appliances include a Sub-Zero refrigerator and freezer and a Thermador range hood, mounted over a Garland six-burner stove. It’s enough to make a “Top Chef” envious. The commercial stove is tucked into a butcher block-topped island with a wet sink. Around the perimeter, Ubatuba granite shines like glass. You won’t lack for storage, thanks to custom cabinets, including built-in china cabinets, with rollout shelving. Grab a cup of coffee and nestle into an armchair in the den, whose nearly floor-to-ceiling windows flood the room with buttery sunlight. The room has a vaulted wood ceiling, which is also the case in the master bedroom. The suite features his-and-her closets, both with cedar sections, a balcony and a bathroom with a rich green marble floor, dual-sink vanity and programmable towel warmers. The suite, accessed by the living room staircase, is set apart from the other upstairs rooms, which have their own staircase. Privacy is ensured. Currently, a home theater with about $25,000 of high-tech equipment – including a projector, screen and sound system – joins the two bedrooms on the opposite side of the house. The handsome theater has a powder room, custom cherry cabinets and easy access to the outside via a spiral staircase. However, the space could easily serve as a spacious fourth bedroom. Whether this is a primary home or a vacation home, a Saturday would leisurely stretch before you. Take a dip in the pool, entertain guests on the veranda, or read on the screened porch. If there’s a nip in the air, light a fire either outside or inside. On warm days, stroll down a gentle slope to the 95-foot pier, which has three slips and a 23-foot floating finger pier. Take in the sun here or sail over to The Kitty Knight House, visible on the horizon. No matter what you do, it’s just another day in paradise. 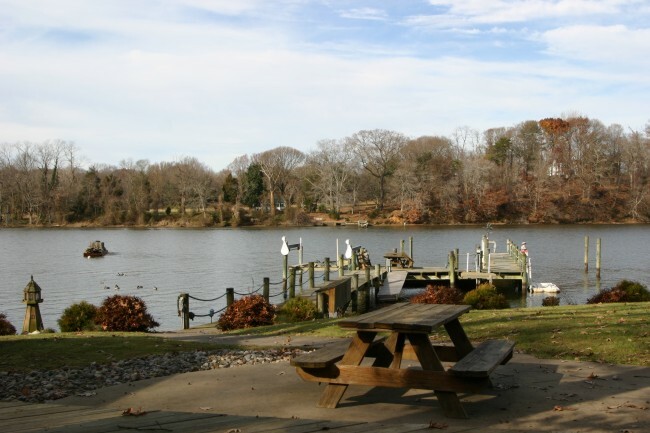 The Bay House located on the Sassafras River is a boaters dream come true. The 150’ pier with electric and water has multiple slips, floating sections and jet ski lifts. With 6’ MLW the pier can handle a large power or sailboat. There are even two sets of steps to your sandy beach. Reminiscent of a camp on a Maine lake this rambling home has room for you, your family and all your friends..it goes on forever. The kitchen is nicely designed to allow your guests sitting at the breakfast bar to enjoy all the happenings on the Sassafras River. Off the kitchen there is a large living room, family room and a cozy den.. A large deck that spans the entire length of the home and screened porch embrace the waterside of the home and look out over the pier and river beyond. After a fun filled day on the water the children can roast marshmallows over the fire pit putting an enchanted glow on an already memorable day. Georgetown Harbor is but minutes away by boat or car. You have four eateries and 5 marinas to choose from for your gastronomical and boating needs. The Harbor plays host every 4th of July to a boat parade and evening fireworks. Living on The Eastern Shore is truly a different way of life. Fast paced becomes slow, you have more time to enjoy life and people who are important to you. The Sassafras becomes your gateway to explore all the Chesapeake Bay has to offer. The river, in my humble opinion, is the prettiest on The Shore.